Pictured: The official seal of the ACCME Accreditation with Commendation awarded to JABSOM CME. The Hawai’i Consortium for Continuing Medical Education (HCCME) is accredited by the Accreditation Council for Continuing Medical Education to provide continuing medical education to physicians. The John A. Burns School of Medicine’s Office of CME is responsible for the administration and management of the certification program for JABSOM’s continuing medical education activities. 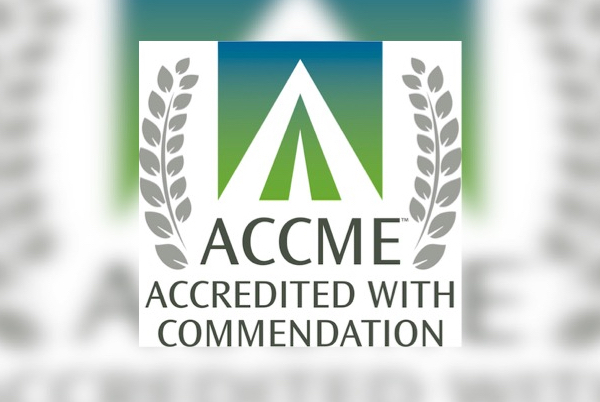 In 2016, the CME program received ACCME accreditation with commendation. The mission of the HCCME, a joint venture of the Hawaiʻi Medical Association (HMA) and the University of Hawaiʻi John A. Burns School of Medicine (JABSOM), is to support the highest quality of patient care by educating current healthcare professionals and physician leaders in Hawaiʻi and the Asia-Pacific region. We believe that excellence and leadership in healthcare is accomplished through a continuum of medical education and to that end, we provide activities that are evidence-based, translational, within community partnerships and directed to improving the competence and performance of physicians and health of our community. The service provided by CME is recognized through legislation which mandates evidence of CME as a requirement for licensure in Hawai‘i and increasingly, CME is required for physicians to maintain certification by national specialty boards. CME equally serves as a vehicle for faculty development. Administrative responsibility for the Office of CME rests with the Associate Dean of Medical Education. For questions regarding the Hawaiʻi CME accreditation process, activity development or applications for designation, please contact Brenda Wong at (808) 692-0900 or email brendaw@hawaii.edu.